Welcome to our site. This site serves to expose you to various stories and theories from all over the world, with the intention that we share our own stories and comments with others. Register today and start reading now! If you have ever experienced something frightening, or have a story to share, please contact us. 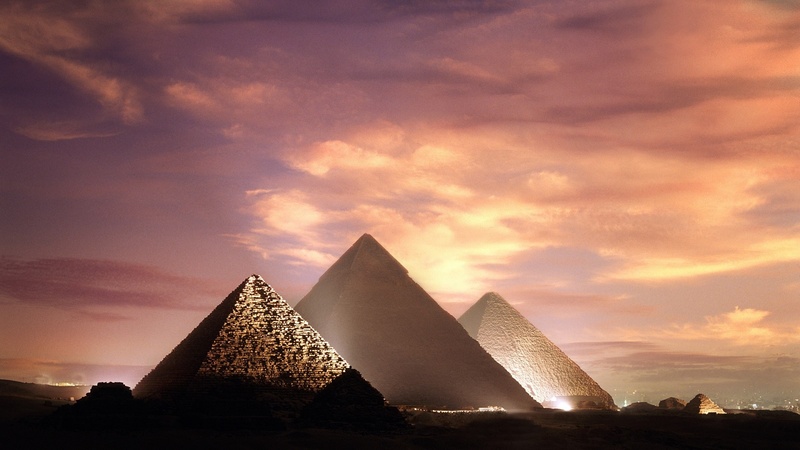 The first, and largest, pyramid at Giza was built by the pharaoh Khufu(reign started around 2551 B.C.). His pyramid, which today stands 455 feet (138 meters) tall, is known as the “Great Pyramid” and was considered to be a wonder of the world by ancient writers. The pyramid of Khafre (reign started around 2520 B.C.) was only slightly smaller than Khufu’s but stood on higher ground. Many scholars believe that the Sphinx monument, which lies near Khafre’s pyramid, was built by Khafre, and that the face of the Sphinx was modeled after him. The third pharaoh to build a pyramid at Giza was Menkaure (reign started around 2490 B.C. ), who opted for a smaller pyramid that stood 215 feet (65 m) high. Over the past two decades, researchers have made a number of discoveries related to the pyramids, including a town built near the pyramid of Menkaure, a study showing how water can make blocks easier to move and a papyrus found by the Red Sea. These have allowed researchers to gain a better understanding of how the Giza pyramids were built. The new finds add to older knowledge gained over the last two centuries. I can not guarantee what I’m saying, but I have to give my opinion on this. Pyramids were built almost five thousand years ago as you could read. If you have ever learned about history, then you know that people in that period were much lower, weaker, and so on. According to some records, it is assumed that the average height at that time was exactly 1 meter. Imagine now, group of people that are actually so weak, pushing a 3 tons stones and built pyramids. These pyramids are over 100 meters high and we wonder how they could lift those stones to such a high altitude. There are many other questions that I would like to bring to you, but I would first like to hear your opinion about this. Do you think I am right about this? Were there giants at that time? Or some other force. I would ask you not to offend me if you do not believe my story. This is a website where all people can share their thoughts and together we are talking about some topics. By some sources, there were a giants that lift that rocks and actually helped people of Egypt to built pyramids. Some sources tells that there were an aliens that helped. But, when you look at these photos, there are really strange THINGS and CREATURES, and HELICOPTERS on their paintings for almost 5000 years ago. Lot of people think that Egypt pyramids are only pyramids in world. According to some sources, there are around 300 pyramids in the world. Some of them are on Antarctic. Mainstream historians will tell you that the Great Pyramid of Giza was a glorified tomb for the Egyptian pharaohs. The only original monument left of the original Seven Wonders of the World, this structure was created with impeccable mathematical precision, and is a unique, mysterious feat of construction and engineering. There’s only one problem; the Great Pyramid has none of the characteristics of tombs: including extravagant artifacts, ornate wall art, sealed entrances, elaborate coffins, or even mummies themselves. It was, however built with unique – the same materials that are used for electrical conductivity today. These facts are leading more and more historians to believe the pyramids may have had a far more useful purpose. ..that pyramid of Giza was not at all a tomb, but a power plant: generating and transmitting electricity to the civilization surrounding them. Sound impossible? To start, it’s important to comprehend the tremendous effort that went into creating these monuments. The Great Pyramid of Giza is one of among no less than 118 of these structures in Egypt alone – and that doesn’t even include those pyramids in other parts of the world. Given our current understanding of how early civilizations built their monuments, it would have taken no less than 20 years to build these so-called “tombs”– and that’s if no less than 20,000 workers worked DAILY. To this day, historians STILL can’t prove exactly HOW – or WHEN – they were built, since the blocks weigh an average of 2.5 tons, and we are boggled by how ropes, pulleys, and waterways somehow moved and lifted these enormous blocks. No one can duplicate the effort with the same materials; it remains a mystery. This leads us to ask what resting place for the dead could possibly be so important that it would warrant such phenomenal effort, time, and precise engineering? Even without knowing that they have nothing in common with regular tombs, you only need to stand before them to realize… that’s a lot of work for a cadaver! Naturally, we make conclusions based on the assumption that ancient civilizations were more primitive than us… but what if intellectual evolution isn’t always linear… can advanced technology be lost, and rediscovered centuries later? Is it possible that an ancient culture had knowledge of – and used – electrical power? To know for sure, let’s look at another case where the technology of power generation appears to have been used – and then, forgotten. We know Edison and Tesla brought electricity into common use at the turn of the 19th century. Yet, In Iraq in 1934, three artifacts were found together: a ceramic pot, a tube of copper, and a rod of iron which – when combined with a liquid acid – can be used to create chemical reactions that produce an electric charge. Known as the Baghdad -or Parthian- battery, these materials date back 2000 years. Ten years after their discovery, someone using grape juice with similar materials to successfully generate a few volts of electricity. This process has since been demonstrated on the Discovery Channel’s program Myth Busters, where lemon juice activated the electrochemical reaction between the copper and iron, producing 4 volts of electricity. Nowadays, you can simply search online to find instructions on how to create your own battery using these chemical principles… but historians have long assumed that thousands of years ago.. there was no knowledge of this technology… that this archeological find is mere “coincidence” even though we’ve long marveled over artifacts with intricate gold plating – which requires electricity to be created.) Quite simply, energy generation happens as result of simple chemical principles, and can be done by anyone 4 basic materials. So here are some important facts about the structure and materials of the pyramids: For starters, it contains angled tunnels which lead not only into the pyramid, but deep underground, to areas claimed to still be unexplored. What tomb needs a shaft directed into the earth? Though you’d almost never know it, The Great Pyramids of Giza were once covered in white, polished limestone, referred to as “casing stones”. The cuts made in this reflective stone were angled perfectly, so it would have had a smooth, flat appearance. This would have made the giant structures brightly reflect the light of the sun like a mirror. It also would have made perfect insulation inside the structure. A large earthquake in 1303 AD disrupted the casing stones, so they were removed to use on other structures. Today, all that remains is the inner core of the pyramid. The image of the incredible amount of light that would have reflected from the monument raises curiosity… as does the reason for the insulation. Was there a desire to draw attention to their dead? …to keep the mummies warm . or cool? Or something else? Next, the material, Dolomite was used on the inner surfaces. Dolomite is known to increase electrical conductivity directly relative to the amount of pressure on it: high pressure creates more electrical current. Next, Lining the passageways and underground tunnels of the pyramids is granite, which is slightly radioactive. Granite contains high amounts of quartz crystal and metal, a well-known conductor of piezo-electricity, piezoelectricity occurs as result of stress or pressure on the quartz.. as demonstrated by the Wristwatches which can be charged simply by rapidly shaking them. This Granite actually ionizes the air inside the pyramid, creating a chemical reaction which – again – increases the conductivity of electricity. When such electrons are given the chance to bypass sections of rock via a metal wire, quite large currents can flow. Another important material used is to construct them is the mysterious mortar – half a million tons of it – which holds the giant stones in place. 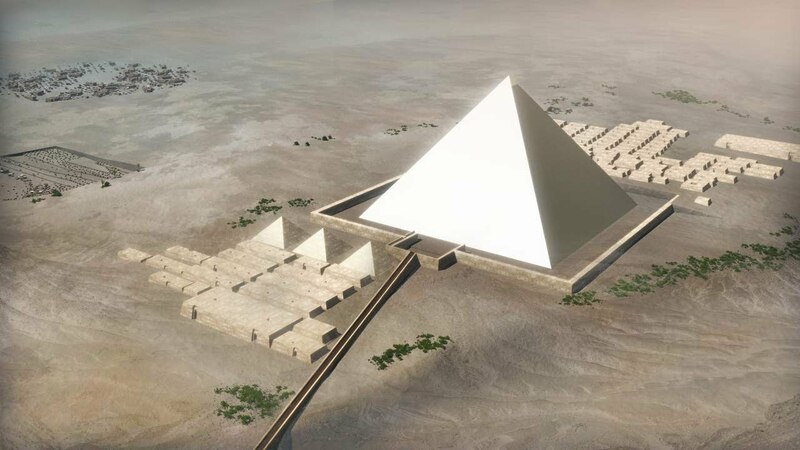 Though it’s been analyzed many times, modern technology has yet to exactly recreate the same gypsum – which comes from sediment –used on the pyramids. This gypsum can withstand tremendous pressure, and astoundingly, is even stronger than the stones themselves. Clearly, it has thus contributed to keeping the monument intact for thousands of years – but could there be another reason why they used a material which could withstand such high pressure? So Limestone, dolomite, granite… supposedly constructed for a tomb, are in fact, analogous to the exact materials we use to make electrical wires. They also share a relationship with pressure, which increases their electro-conductivity. Each and every one of these huge “boxes” also has a giant lid carved from the exact same stone. In the meantime, any electrical engineer will explain that a container serving as an an energy capacitor – or battery – must be made entirely of the same substance so there is no interruption in the magnetic field. Could These boxes could be just that? If so, the centuries-old granite sarcophagus on display in an Egyptian museum that was thought to be “unfinished. ” Unlike those in the pyramids… This one is actually cracked – suggesting that perhaps, it was not unfinished, but simply abandoned because the crack which occurred would have interrupted the magnetic field, permitting it from successfully serving its purpose. So there is clear evidence to support the possibility of an electrical – unless you want to believe the bull … coffin. Theory. What really happens after we die? To add to the mystery, in 1993, a mysterious, and inaccessible room was discovered underneath the pyramid, after remaining hidden for thousands of years. Appearing to have deliberately been concealed by the structure’s engineers, the room came to be called “the Queen’s chamber” – and was finally explored in 2011 with a small, remote camera to reveal…. a long-lost mummy? Hardly… it contained carefully crafted copper wire … and more importantly, there were instructions painted as symbols onto the floor, which appeared to show a clear wiring diagram. Look at any battery, from those used in large power plants to the smallest pellet batteries used in wristwatches, and you’ll see that they require a metal – such as copper – to create the chemical reaction known as “potential difference”. you can run an electric current through a copper wire, and the coil will produce a short-range magnetic field. Add a second coil, and the power is transferred from one coil to the other – – works in an electric toothbrush, works well over short distances. In the right conditions, A windowless room with Copper pieces could create a higher potential on one wall which transfers energy to the lower potential on the other wall, consequentially releasing electromagnetic energy into the confined space. Sadly, these wires have since disappeared entirely, and mainstream Egyptologists claim there is no functionality whatsoever to the room – as they also claim there is no functionality of anything in the structure beyond the ways it serves as a tomb. A good place to note, that the foremost Egyptologist Zahi Hawass was indicted for theft of Egyptian antiquities. It could still be argued that the electrical materials used to construct the Great pyramid are simply coincidental.. an energy generator still requires a catalyst from another source. Perhaps then, this explains why the pyramids are geographically located over the most natural power generators: underground rivers and aquifers. Physio-electricity could be harnessed from the power of the current as water flows . since it’s been proven that thousands of years ago, the Nile river passed directly by where the structures now stand. Of course, this debates the age of the pyramids themselves… along with weathering on the nearby Sphynx, which indicates that they endured tremendous water erosion, and would indicate that the monuments are actually double the age they are currently assumed to be. Perhaps that would explain why there is no mention of the pyramids or of their creation in any of the Egyptian writings…. So if water was a source of power, it would have traveled up the limestone based on the principle of Capillary Action, which happens when a small area of a substance that gets wet absorbs into the entire area. 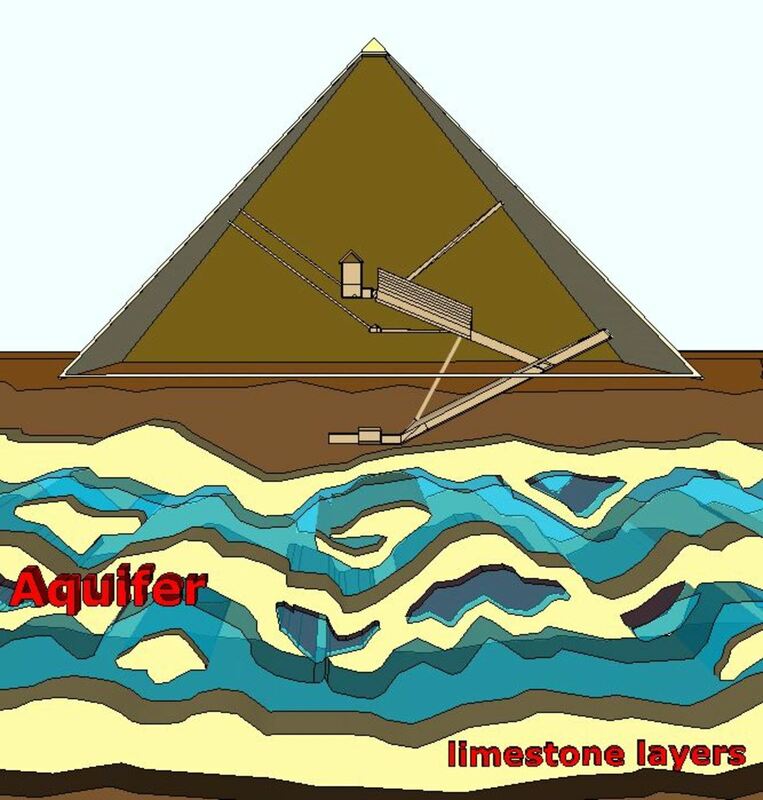 This is how the water travels over water flowing near or underneath the pyramid could have been absorbed as it passed over the limestone, even traveling upward to the top of the structure. The quartz in the tunnels of the pyramids would subject to the stress, or vibration, creating Piezoelectricity The high force, the speed of the rising water and the pressure would be analogous to filling a syringe… generating electromagnetic energy within the structure by the materials within, and conducting it upward to the capstone… But why? If the reason for the superconductive materials used to create this monument was energy… then the potential for something even more amazing would have be possible: electricity … without any artificially integrated conduction material or means … could have transmitted wirelessly through natural means through the air and to the surrounding area. Sound far-fetched? We know of Nikola Tesla as the solitary genius responsible for the Electric engine, radio, laser, radar, and for creating a tremendous competitive spirit in Thomas Edison. We know that he Sought above all to serve mankind, not to self indulge for profit. In fact, despite his extraordinary contributions, He is scarcely known or credited for his genius. At the 1893 World’s Fair, Tesla transmitted electricity naturally to light a bulb he held in his hands, and that he created the Tesla coil, which is used more for show than the function it was intended to serve. 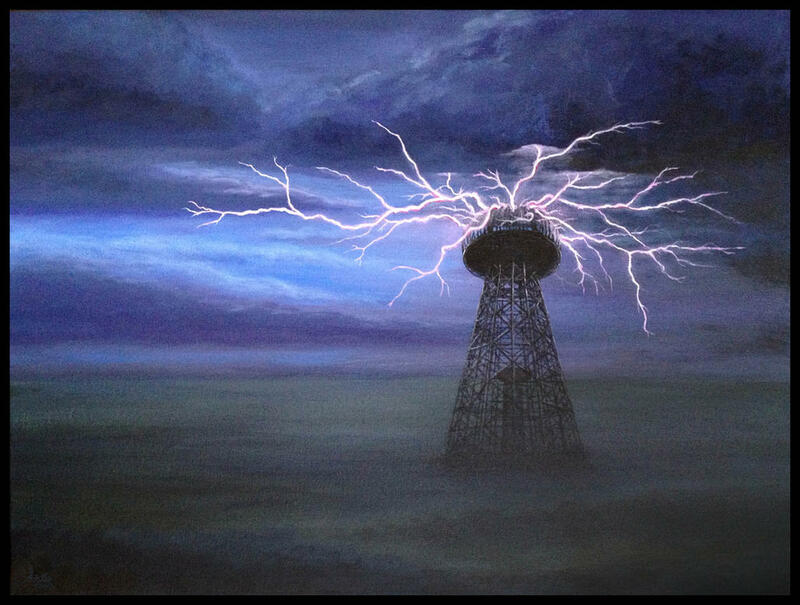 Most importantly, we know that Tesla Claimed adamantly that he had perfected the method of harnessing and transmitting free, wireless energy from a source using the electromagnetic nature of the earth. In an experiment the last week of July in 1903, nearby residents claimed to have witness Tesla successfully conduct his experiment at the Wardencyffe tower – while Tesla himself later shared how his new method of conductivity had lit up the night sky as if it were a giant fluorescent tube. It’s even been said – though that he successfully wireless transmitted pictures and sounds, though all of his work has been mercilessly destroyed, this cannot be proven. Sadly, all his technology was confiscated shortly after, apparently, the money he owed was far more important to his financers than the potential of providing free energy to the planet. Tesla died in poverty, and the US government destroyed his tower claiming it was being used by German spies… the implications of the world having free power may have changed our history forever. 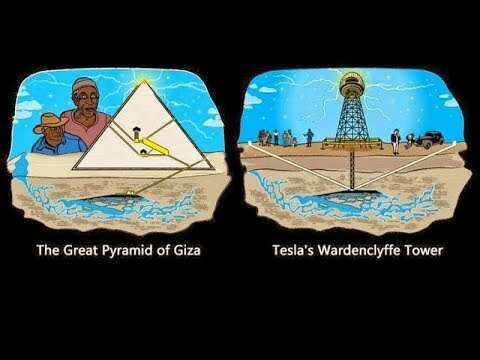 Given what we know, it seems so much more believable that the great pyramid functioned Using the same principles and conditions as Tesla sought to demonstrate… that they conducted and direct electromagnetic energy into the Ionosphere, where it generated and transmitted electricity wirelessly to receivers within civilization. We’ve long believed that the pyramids were just tombs – but this theory raises more questions than it answers: why do they have nothing in common with other tombs? Why the unique construction materials make to build it – including the very materials required for conducting power?Why the oversized granite “boxes”: proven to have never contained mummies? … Or the ones that are clearly too large for humans? Why the alignment with the North Pole, the 20-ton swivel doors, intricate tunnels and chambers, shafts and tunnels that still hold areas yet undiscovered? Why is there no soot from fire torches anywhere inside the structure? Why the strange, intricate tunnel system the tunnels and labyrinths protruding deep into the earth, still eluding understanding by an advanced civilization? More and more people are accepting the possibility that the great pyramid of Giza had a more important function then we understand.. We know there is a heightened Electromagnetic measurement around the pyramid equivalent to that made in an electrical storm. We also know that They are unique eight-sided- precise cuttings and the strange heat spots are observable only from space Unique electric materials, including copper, and design that suggests high pressure, water power … powerful magnetic structure and placement in the center for the continents, the alignment with the stellar constellations, and the unique art which shows clear depictions of wired light sources… suggest there is a lot more to the history than we’ve been told. Some theories go so far as to suggest that The Arc of The Covenant was the cherished property king Ramses sought when he pursued Moses from Egypt.. and that it contained these secrets. All these circumstances make the likelihood high that the pyramid was created to be a compact energy generator and broadcasting system transmits electricity wirelessly. The implications for this understanding of electrical power by an ancient culture are huge: re-writing history as we know it. Do you think that free energy could be transmitted wirelessly around the world? And if you whether or not you do believe, do you think that if it really could, we’ know about it? People who lived 5000 years ago may have been much more intelligent than us. And, just as i said, Pyramids are all over the world, and people use them for lot of stuffs, specially for energy and communication.